After the success of Conan, Monolith and Mythic Games put together another Kickstarter, this time to reinvent the old card-based Mythic Battles game with a shed-load of miniatures in tow. $2.6 million dollars of backers’ money did the trick, and it was delivered in a timely fashion. It’s since been handed over entirely into the care of Monolith, as Mythic concentrate on other things (like the upcoming Joan of Arc). It is, of course, all about the miniatures (which are very nice), but the combat system is a good one and well-tested over time. The unusual dice-rolling method is hard to get your head around at first, but you soon get used to it, and it offers up some interesting choices. Whether there’s enough game here to justify the boxes and boxes of miniatures remains to seen, but like Conan, it will probably come down to the variety of the scenarios. Since Monolith have been supporting Conan pretty well, here’s hoping the same is in store for this game system. One thing both Monolith and Mythic must improve upon however, is the quality of their rules writing. Boardgamegeek is full of people asking for clarifications, and translation issues continue to crop up for both this game and Conan. 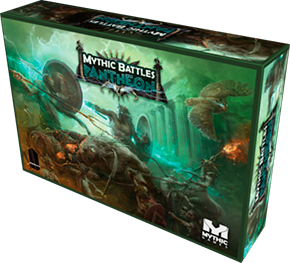 If you missed anything first time around for Mythic Battles: Pantheon, they announced a reprint coming to ks on June 7th. There will be new stuff. If it ships before Brexit I might add something now I know it’s fun to play. Mythic Battles: Reprint is up, but only for 8 more days. Most of original KS is there and a few new bits. Also an upgrade kit 1.5 rules for $10 and some free backs for the clips on dashboards (if all you want it dashboard clips I think they said they will be free in pledge manager, including postage). I don’t quite understand the upgrade kit – are there actual fixes in there? Rules eratta. Revised dashboards, troop cards and tokens. Apparently it’s mostly for ournament play and both versions playable. Getting a 404 error when I click the link. Are you using me as a news source? Not sure what you mean – example? Only things in my Twitter feed appear in my Twitter feed, and there’s no automatic link between it and anywhere else as far as I know. Overturn was suspended and I posted before you twittered. I saw the link to the long article about the issue somewhere else actually, I only remembered later it had been mentioned in this forum. Yep, coincidence.